Like to lead your own adventure? Pontoon boats are the ideal way to navigate your family around the islands and intercostal waters of South Alabama. Hudson Marina offers various sizes to accommodate your group. There are also luxury and standard versions available to fit your comfort and needs. We are also very pet friendly, so feel free to bring your furry friend along with you for the ride! Our well trained staff will help get you off and on your way, and assist you in operating your vessel. The Dock Store also provides you with a waterproof map of the area for just $10, which you are welcome to keep and bring back with you on future visits to our area. Upon your check-in, you will be greeted and given a Safety Operations Course which will educate you in how to safely operate your vessel as well as avoid potential dangers and accidents which can occur in our area. You will then be assisted to your boat for a brief inspection and operation instructions of your boat, and our dock hands will help in getting your family on your way. Keep in mind that you are responsible for your rental and any damage that may happen to your vessel, yourself, or any other party. So we encourage you to ask any questions that you may have about driving the pontoon boats. 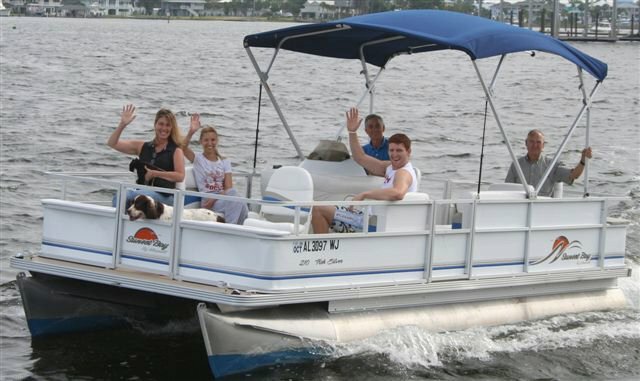 With your pontoon boat rental, your family will be able to cruise Orange Beach and the coastal waters of our area. At such a convenient location in the bay water area, comfortably cruise Alabama shorelines to view the houses of Ono Island, nature of Robinson Island and Wolf Bay, and visit the restaurants and bars of local landmarks which are best visited by water! Always keep a look out while out on the water, you never know what friendly creatures you may encounter. Dolphins are frequent in our area, but please resist from trying to feed them from your boat. Bring your fishing gear and license? If you enjoy Inshore Fishing and already have your own personal fishing license, renting one of our center console boats could be ideal for you and your party. Renting boats can give you the independence to fish, play, and enjoy all on your own time. Especially if not everyone in the family is a fishing person.